It all started when I approached Merrick to be a sponsor for a charity event. They liked the idea very much. I was not aware that they are so charity minded. And I can tell you, I had no idea how charity minded they really are. They said they could donate sample bags of their new product Before Grain for the event. They asked how many bags we would need. I told them 1200. They did not bat an eye. They could not wait to come on board. I thought I hit the jackpot. Sure enough, I did. Merrick sent me a sample of the gift bags. It was impressive. There were cans of Before Grain for dogs and cats, 1 lb bags of dry Before Grain for dogs and cats and some sausages and flossies. I could not believe the size of each bag. 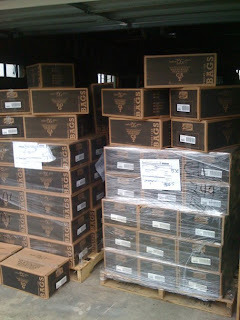 Well, with the snow and floods the delivery was not made in full for the event, so the bags were only filled with half the product. Since it was already here, I asked Merrick if I could donate the rest on their behalf to all the shelters and rescue operations in our area. 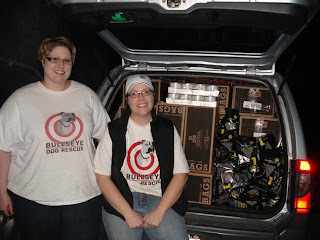 10 cases wet dog and cat food 15 cases dry dog and cat food to Bullseye Dog Rescue. 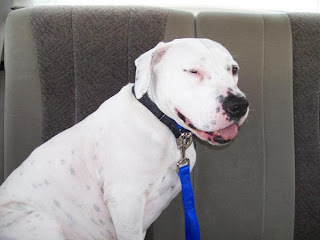 Contact Gretchen Andersen 206.372.3751 gretchen@bullseyerescue.org. I actually met them at the Kent Animal Shelter after my delivery. They were there evaluating the pit bulls for foster/adoption. I love this group! They are also a great resource for your pals when you go on vacation or just want them to have every day care while you are at work. They are Muddy Paws Pet Sitting and Dog Walking. Please support them and their business. It enables them to devote much needed and important time to help save one of the most beautiful breeds. The ever discriminated and abused Pit Bull. Jennifer and Gretchen are rock stars and I so enjoyed that we could help them! 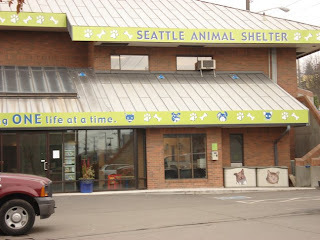 36 cases wet dog and cat food 24 cases dry dog and cat food and 5 30 lb bags to Seattle Animal Shelter. Contact Kara Main-Hester 206.386.4293 kara.main-hester@seattle.gov. We had hoped to donate to Animals First Foundation in larger quantity than we did but without realizing it, we had run out of dog food. 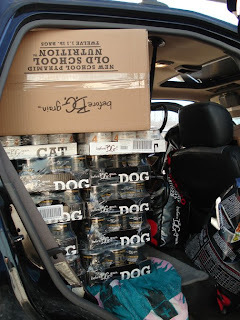 We still had cat food left so we were able to give them some dog but plenty of cat food. Heather with Animals First came and took more cat food for the food bank in Burien in response to the call put out for pet food. They are in desperate need as there are many seniors in the area who cannot afford to feed their pets and themselves. AAUURRGGHHH!!! Heather with Animals First is also going to be getting more of the cat food to take the to Ballard Food Bank who also put out a call for pet food. My friends who own the Sauer Kraut German Deli and Bakery in Squim stop by and I was telling them what I was doing and how amazing Merrick is to donate all this food. I asked if their area was in need and they mentioned their neighbor Linda Kemp who has been saving cats for years. I was delighted to help her with a few cases and will post more info on her when I receive it. 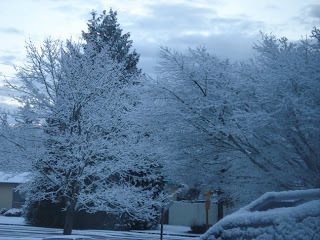 My name is Linda Kemp and I am a neighbor of Dan Heintz from Sequim. 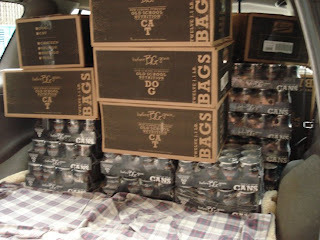 He brought me many boxes of BG dry cat food which you gave to him. I can't tell you how thrilled and how grateful I am in receiving them. I am sure he shared the story about my paraplegic yellow lab dog, paraplegic cat, diabetic cat and 2 other healthier kitties that I care for. The no grain diet is what I feed my diabetic cat so this food was perfect .... I am also getting the other kitties to eat this way too. 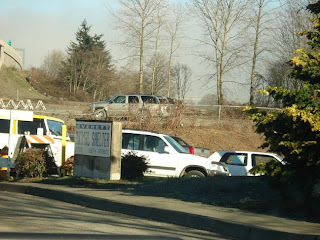 I am a member of Peninsula Friends of the Animals, who have the Safe Haven facility here in Sequim. My life has never been so blessed since taking on these special furry angels, thanks to caring people like you who make it more possible to care for them too. I also would like to report that Merrick is going to do another amazing delivery of food for the horrible situation of 600 dogs in a puppy mill scheme outside of Seattle, that came to light this last week. I had just finished my donations when I learned of this atrocity and even after donating 5000 lbs of food they were going to do more! WOW! 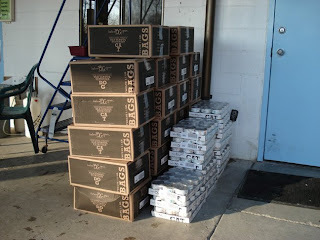 In light of the times and economy Merrick is donating in record volumes. I give them 5 out of 4 paws. I have the utmost respect for their mission in this industry. They are one of the two last privately owned pet food companies left and you can see how much of a difference that makes. 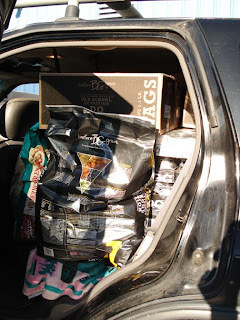 Donating to the local grass roots efforts and some of the best food on the market for your pet. This is just what they have done for Seattle. I cannot imagine what they are doing in the rest of the country. You go Merrick and thank you for letting me share in your generosity! I had a great opportunity to meet Penelope Jensen at the Seattle Dog Winterfest. She advises on animal communication and understanding. I was very eager to get a chance to look into the mind of The Zappa. Our girl is a deep soul. Seemingly tortured and thus the desire to better understand her. Penelope did a reading for me and it was just amazing. Spot on, inspirational and what she brought me helped me to find myself re-engaged with the light inside. Here I thought I was going to talk about The Zappa. Sometimes we find ourselves lost. Our path does not go where we think they should and uncertainty can work it's way into our hearts and minds. After just 20 minutes with Penny, I really felt invigorated and back on track. It was cathartic and the freedom I was left with, is magnificent. We did get a chance to touch on Serch and The Zappa and I will be going back to learn more. I urge you to take an opportunity to call or email Penelope Jensen penelope.jensen6@yahoo.com or 253.447.8332 for a consultation. You won't be dissapointed. Here is just a small sample of what Penelope brings forward with her incredible gift! 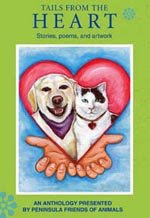 I was honored to give readings at The Seattle Dog Magazine Winterfest over the weekend. I meet many wonderful people and many truly amazing dogs! The one that stands out in my mind is a little black mix, Toby. He was found on the roadside, torn up, his left eye was out of it’s socket. 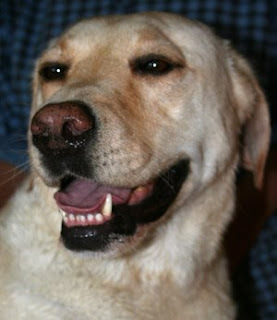 He was a lucky boy; Ginger’s Pet Rescue provided life saving veterinary care and a foster home for him to recover in. Toby did lose his left eye, but not his spirit. This week’s communication tip is his inspirational message. I do not remember where I lived; I just know I had a Home. I was chased by a bigger dog. He lost interest and left me. (Toby is not sure how his “accident” happened). My life changed in that moment as did my purpose. I was determined to survive. In my recovering condition, I’m scared by all the new activities, places and things going on, yet I am hopeful. I see looks of horror, others of compassion, some just look away. Do not pity me, I am a Survivor, I have new purpose and I am stronger in character than ever before. I have Love on my side! Love has brought me back from the brink of death and willed me back to life. Love is why I am, love is my purpose. I now look upon you, with just one eye, eye to eye we connect and I send my Love, 50 times bigger than I am, straight for you! Can you feel the most powerful force in the universe?? I can, and I gladly send it you! You who need hope, you who need direction, you who need a purpose! There is no higher calling then giving love, it is all I have, it is all I am! You too can reclaim the honor of being the bearer of love. Join me and love all you see. Judge no more, claim love and be alive with joy! We all are connected, connect in love. Toby is up for adoption and is looking for a boy to love. He would prefer someone preteen, in a calm household, and of course respectful; he wishes to love him into adulthood. 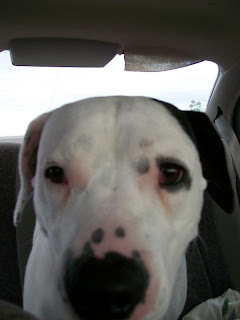 Contact: www.gingerspetrescue.org or for Toby or for info on her available dogs ready to be adopted. I decided that I would keep her after all. She is really attached to me and it would break my heart to see her unhappy. As long as we are together she is perfectly content. I am currently in the process of finding a dog friendly apartment that we can both live in. My Fiancee' and I found her roaming the streets of Portland when she was just a couple of months old. She was following a family who when confronted did not want anything to do with her, she had been following them "for about a mile" they said. She was pretty scrawny so we picked her up and took her home. She took to My fiancee's dog immediately, they were inseparable. So we thought maybe we should keep her around. We brought her to the vet to get her checked out, see if she was registered. She wasn't registered but was malnourished. We got her spayed and chipped her. After a couple of years my wife left and I was taking care of hte dog alone. She likes to run about 5 hours a day, and I was working 60-80 hours a week and it just wasn't possible. She is crate trained, but it's no fun being cooped up in a 3x4 foot crate all day long, only getting out once a day for a bathroom break. This was just all I could do for her. I decided top adopt her out to a nice family with a couple of kids, a stay at home mom, another dog, and a big fencd in back yard. They loved her for a few months, then decided they didn't want her anymore, she was "too much work" even though I told them what she really needs is to be run for hours a day. So, they ended up giving her to someone else, and she has been through 2 or 3 homes before being abandoned at the shelter in Troutdale Oregon as a stray. The shelter got in touch with me, they were going to euthanize her, so I decided it would be better for me to go down and get her and try and find a new home for her. My roommate has a house full of animals (cats, turtles, rats), and the landlord won't allow dogs at all, especially not pitbulls! And, even if we could keep her she'd still be in a situation with not enough exercise, and being confined to the crate most of the day. So, I am hoping you can help me out. I really want to avoid Craigslist, I really don't trust it. Do you have any advice or contacts or anyone that you know who can help? Final count on adopted dogs from the event is 19. 19 saved dogs!! How amazing is that. How could you not call that a success. 19 dogs won the doggy lottery and almost 200 folks got to meet Cesar Millan. Well, I say that is much to be thankful for! I know every rescued pup thinks so as they are no longer living in a box on a cement floor. They are in their new homes being loved, pet, fed well and sheltered in kindness. What a great success despite the hiccups. Ginger's Pet Rescue adopted out over 10 dogs with 2 of them being special needs. How is that not a success! That is the great news to be shared. There were a few confusing facts put out, that created some inconvenience. I know from experience, that can happen with a first event. As a vendor, I have had it affect me. Some times it becomes a live and learn situation and the next time, those are all avoided. Everyone involved felt so bad that the patrons were stuck in a difficult situation. Every person volunteering took it personally, even though it was not anyone's intention or really anyone's fault. Even though not every person had the experience they were looking for, it was all about charity. Perhaps the focus can change and the community can show support for successes of the event. When passions run high, it is usually because someone cares. It was a great show of the love owners have for their dogs, that they wanted to share with them the experience of Winterfest. Again, there was so much that was positive. Vendors involved with Winterfest, jumped right in to help in light of the confusion. I could not have been more proud for all the efforts to rally around and try to insure a succesful venue for our dogs in need. That is what it was all about. That great show of commitment to the cause came from (to mention a few) Bark Central who were on hand with boarding and doggy play and Fetch Pet Care stepped up to give dogs walks so folks would be able to enjoy the show and get a chance to meet Cesar Millan. 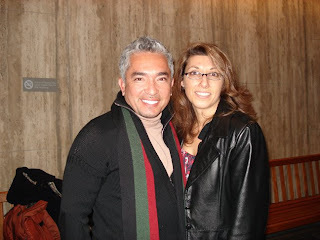 For me, meeting Cesar Millan turned out to be an amazing experience. He is truly a great person! It was a once in a lifetime opportunity to meet him. I can tell you, you can feel his energy, his calm and his strength. It is all supported with a humble respect and appreciation that explains his ability to rehabilitate owners and their dogs that suffer with poor behavior and such severe aggression. He truly believes in the importance of dogs natural behaviors and the balance of people in that equation. You can feel it in him. You understand his ability to give calm and order and pack position to stressed, confused, aggressive dogs. Dogs that desperately need to live a kinder life. As much as Ginger saves dogs from death row, out of puppy mills and off the streets, Cesar stops them from getting there in the first place. I heard a story of a family who had a dog that was aggressive and had poor behaviors. They did not know what to do but certainly did not want to give up their family pet. The wife was able to take Cesar's tips and training methods and save the family pack. Another success story for dogs and their 2 legged companions. Not everyone can learn from a show or tapes, they need a hands on trainer. Like Deborah Rosen of Good Citizen Canine who put on a wonderful seminar during the event. She spoke on her specialty, Dog on Dog Aggression and how to deal with and retrain that behavior. There are always options. If Deborah is not in your area, you can read her website to find the tools you need to find a qualified trainer in your area. The event not only made me feel good for it's charity goals and the adoption of so many dogs, it was a great reminder that sometimes, you just need to go with the flow. And who better to show us how to do that than our canine companions. Kristy posted a comment on this issue. Thank you for that! It takes all of our voices and I truly appreciate your time. You bring up a good point and we certainly need to round out our legislation for the owner of a pet, with proper regulations for the support to facilitate the legislation. To insure that all parties are held to the highest level of behavior. When we have regulations in place, we have a better opportunity to educate the importance of why the legislation is put into place. A great example is our seat belt compliance. It was met with great resistance as a law at first and now we have a 98% compliance rate because of the education of the enforcement and the benefits are, that it really save lives. That it saves us all money on insurance, etc. Now it is common practice, natural behavior. I believe with all of my heart, that we have to change the basic philosophy of thought that we carry as a whole. The earth is not put here because of us, we are here because of the earth. Maintaining the delicate balance of all that lives on this planet is our responsibility. Our survival. If we do not help to continue that balance, we will suffer and who knows to what degree. Our pet population is something that we are in direct control of being able to keep balanced. To reduce the suffering of unwanted animals. As we are the ones playing Mother Nature, mating animals for a variety of reasons. Profit or by accident/abandoned and not fixed to give an example. With so many older dogs abandoned in our shelters, were does it seem right to keep making puppies. Nature would never support the amount of puppies that we see just in the Little Nickel alone. 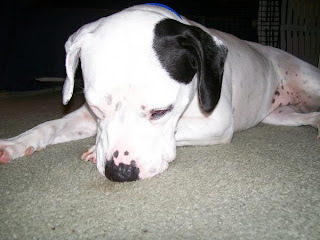 An unwanted dog in the shelter, started out as a cute puppy that needs to be trained to become a great dog. Too much work, a lifestyle that was not conducive to the time it takes, behaviors that you don't know what to do with, all result in an unwanted dog. Thus the sheltered dog is now waiting for us to determine it's fate, while it's living on a hard cement floor surrounded by a cage, with the loud echo of fear and entrapment. The overwhelmingly crowded, solitary conditions go against every grain of a roving pack animal. The results that manifest themselves are depression and stress related behaviors that they can do nothing about. We really need to change the structure of our shelters too. There will always be a need for a transition place. Life shifts. We have all experience that in our lives and thus, so would pets. Educating our community, especially our children on the importance of a proper way to help house our pets in our home or in transition, is part of the true cause and effect that will reduce over population and the need for shelters. Plus, they give us so much. Exercise, structure, responsibility and they teach us other, simpler ways to enjoy life. Reducing the over population of pets, increasing the proper, respectful ownership of pets and creating a truly balanced place for them to reside if there is not a home, is our challenge. They seem daunting in some respects. I believe there is no limit to what we can accomplish if we work together. There is no limit to how we can benefit all that needs it, as a community. When issues come up that need to be addressed, I find most of the discussions preliminary. Kristy's comments made me realize that we should evolve our discussions further. Even with our different opinions, we are trying to reach the same end. We need to strive to find common ground. To bring our opinions together to accomplish our goals. If we take our discussions farther down the line, perhaps we can find where our opinions meet. Thank you Kristy and all those who are out there trying to make a difference. Thank you for your community. For your passion. Please keep spreading the word!